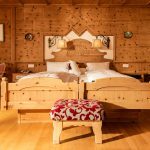 Give yourself a break in the „small but charming“ Schlosshotel Chastè in the vacation region Engadin, Scuol. With a great view on the landmark of Tarasp, the castle. Experience the Engadin tradition with all your senses. 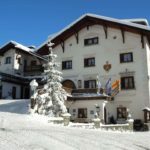 The Schlosshotel Chasè is a charming Engadine house with modern comfort in a very quiet and sunny location. During 500 years enchanted by the Castle of Tarasp – evolution and tradition of a farmhouse. The transformation of the farm into a hotel started in 1912 by installing a modest inn and grocery store during the restoration of the castle. In 75 years the hotel established its international reputation for its syntheses of nostalgic ambiance, exquisite courtesy and top-level cuisine in paradisiacal environment. Noblesse oblige: four stars since 1985 and our distinctions in respect of our guests and history. Our guests get relaxed after an active day outside in our comfortable Swiss pine rooms and our wellness area with different saunas, massages and a steam bath. At the end of the day, kitchen chef Andreas Heidenreich will pamper you with a delicious meal, with recipes from the region. Daniela, Rudolf und Gian-Andrea Pazeller. Cozy rooms, furnished with Swiss pine wood. The Single Rooms Superior have a very nice view of the Engadine mountains. The bathrooms are equipped with bath and shower tray. These rooms are furnished with Swiss pine wood and have a comfortable living area with a private terrace or balcony. Our Junior Suites are furnished with Swiss pine wood and have a a spacious living area that is visually separated from the sleeping area. With only one exception, all have direct access to a private terrace. Our visit couldn’t have been nicer.. We loved everything from our room, to the wonderful food and a warm welcome by the staff. The location was great as well. A beautiful area of Switzerland with incredible views . We also enjoyed some of the history of the area. Very interesting. We only spent one night, but the room and service was outstanding. The scenery was incredible and the castle nearby was very much worth the tour, but is probably better if you are somewhat fluent in German. Thanks John for the tip on mineral springs, we took full advantage of it! I hope to return.